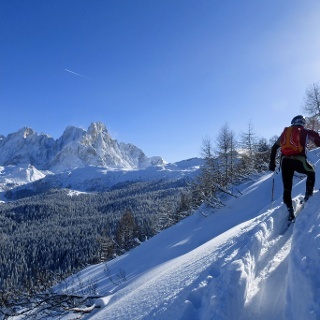 Due to the southern exposure, we recommend to choose the tour right after a light snowfall or on transformed snow, in order to enjoy a nice downhill. Ascent: from the bridge follow the trail winding up to Malga Juribrutto (1912 m). Ignor the bridge and head up the sparse woodland northwards for a few hundred meters. Then turn left and after a long ascending traverse you reach open terrain. To get out of the forest quicker, take short cuts between rocky terrain and large trees. Continue to the top on flat stretches interrupted by steeper slopes, always following the broad ridge up to the right. Some steeper sections or rocky ledges are bypassed left, then always return near the ridge. The final stretch is flat and leads to the small summit cross. Below the summit, at about 2700 m, you find a small shelter for a rest. From Predazzo drive on SS 50 direction Passo Rolle. Shortly after location Paneveggio (13,8 km from Predazzo) turn left on SP 81 to Passo Valles. After 4 km you reach the bridge (way mark Malga Juribrutto-Lago Juribrutto).